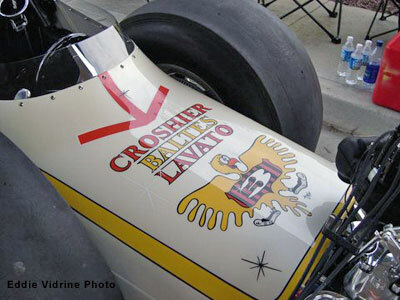 The San Diego, CA based Croshier-Baltes-Lavato AA/FD was originally built in early 1963 and campaigned through the 1964 season. 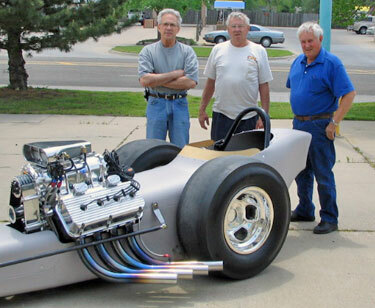 The chassis was built by "TV Tommy" Ivo and Rod Peppmuller. 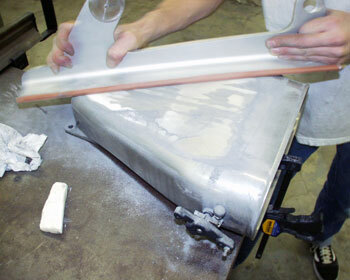 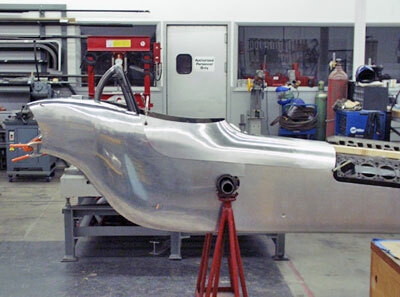 Bob Sorrell sculpted the aluminum body. 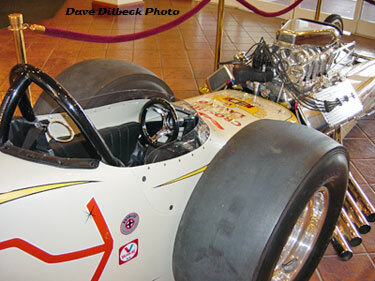 In the two years it ran the car had 3 different paint schemes. 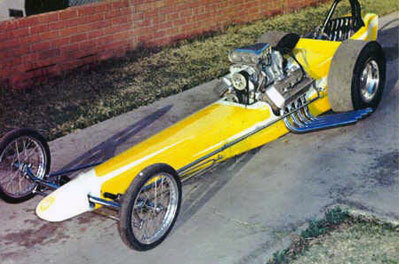 It was recreated with its 1964 colors. 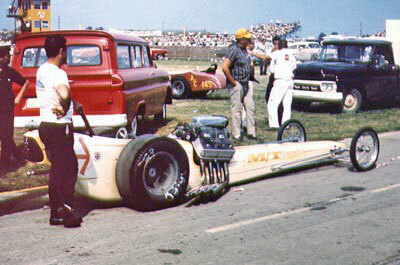 Driver, Jerry Baltes during the 1963 Winternationals at Pomona. 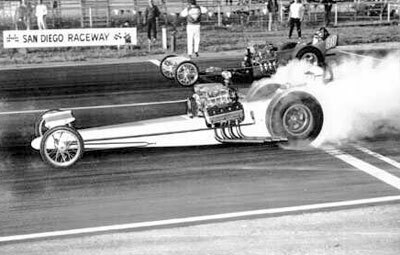 As was the norm prior to the advent of multi-disc "slipper" clutches in 1967, the fuel dragsters would smoke the tires far down the track - sometimes the entire quarter mile. 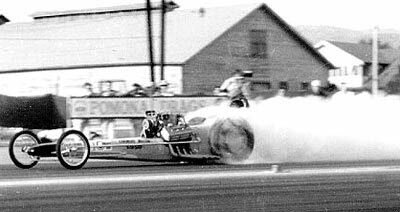 The team called San Diego Raceway (Ramona) their home track and thrilled many a fan with runs like this. 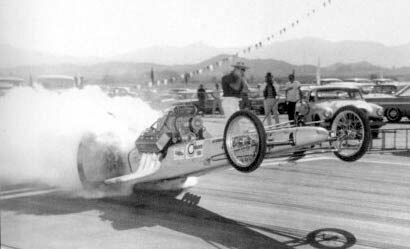 Jerry Baltes leaves on Tom Hanna at Ramona 1964. 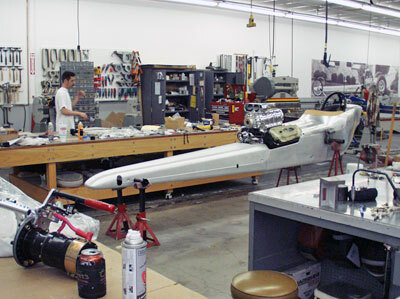 Ironically Hanna would be the craftsman who would recrate the Baltes car in 2004. 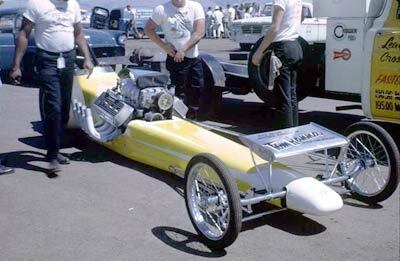 Later in 1964, near the end of its career, the car sported the new "zoomie" headers and a Tom Hanna front wing. 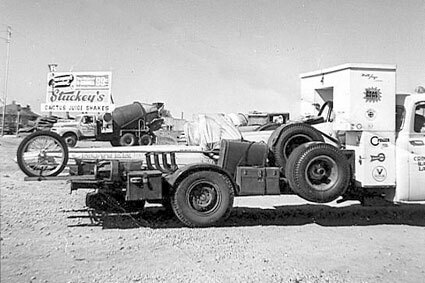 In 1964 Baltes and crew used this state-of-the-art transporter for their Eastern and Midwest tour. 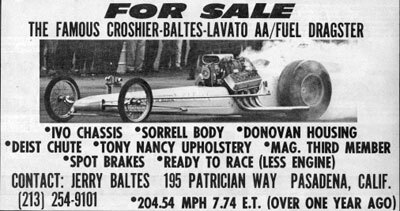 This is an ad from Drag News in 1965. 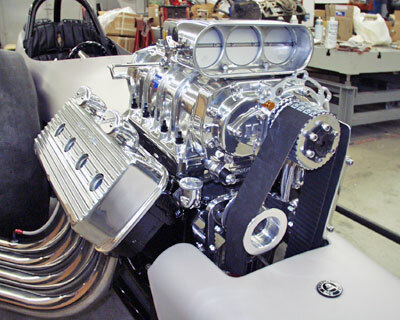 The car was sold and one can only imagine how Baltes, after doing a very high dollar recreation, feels about seeing it now. 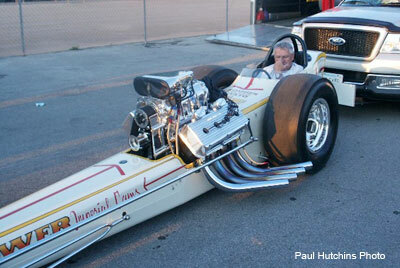 Four decades after Jerry Baltes last raced the car he, like many before him, got the urge to "do it again". 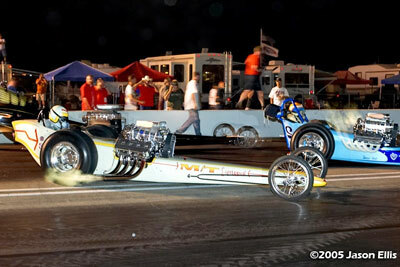 Fast forward to 2005. 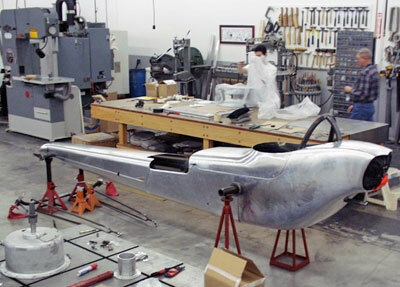 After an exhaustive four year search, Baltes was unable to locate the original car so he contacted Rod Peppmuller to reconstruct the chassis. 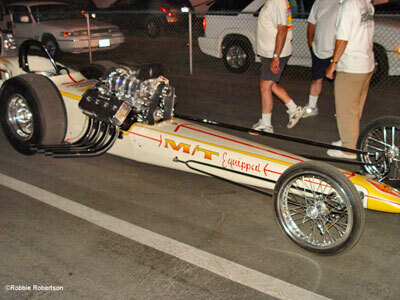 Peppmuller dusted off his memory and built a very clean rendition of his original chassis. 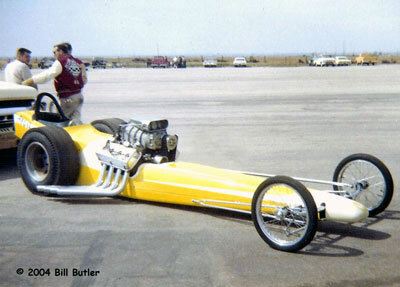 With the original body builder Bob Sorrell having sadly passed on, Baltes contracted his old friend Tom Hanna to do the rest. 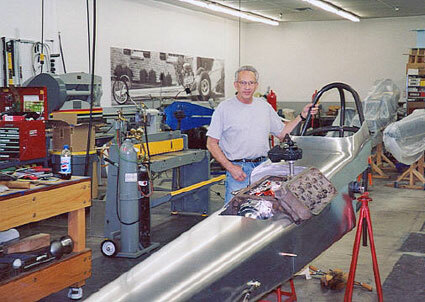 According the Hanna, "To those who do not know him, Jerry is as nice a person as one would ever want to know and super to work for. 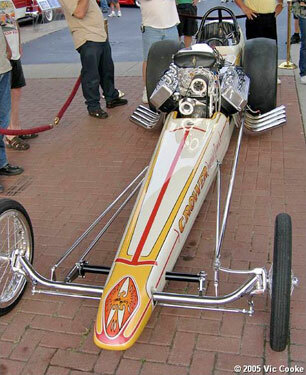 He just wanted it to be instantly identifiable as the original car albeit cleaned up a bit." 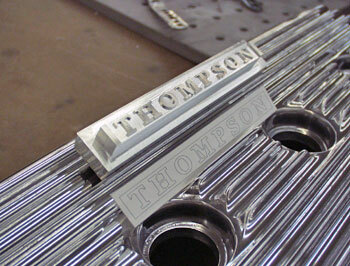 Cleaned up "a bit" means one thing to most people and an entirely other thing to Tom Hanna. 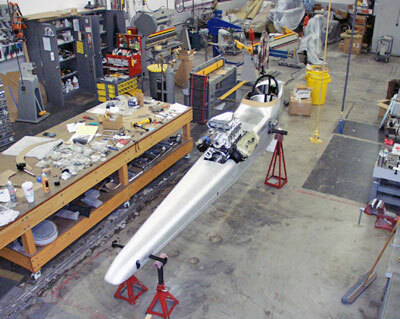 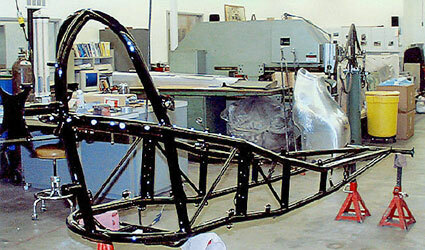 The bare chassis was delivered to his Wichita, KS shop in early 2005 and he and his crew went to work on it. 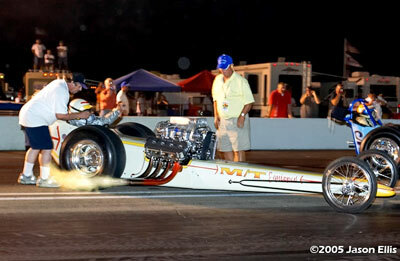 We hope you enjoy the following photos of Hanna incredible craftsmanship, the end product and the cars Cacklefest debut. 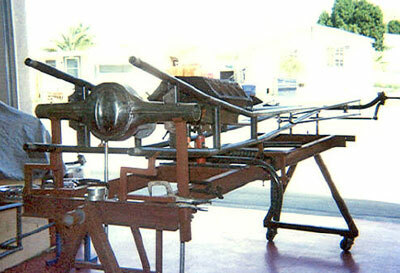 The chassis under construction at Rod Peppmuller's shop. 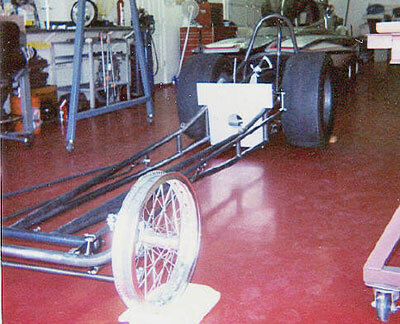 Rolling chassis ready to leave for Kansas. 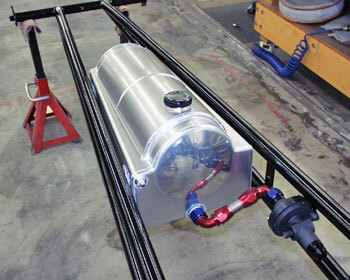 The completed chassis on its way to Hanna's for the body and accessories after leaving Peppmuller's shop. 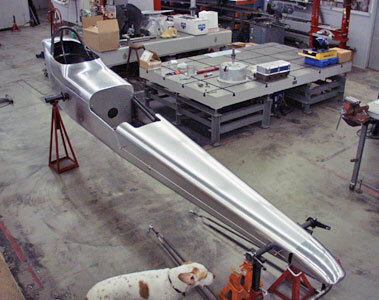 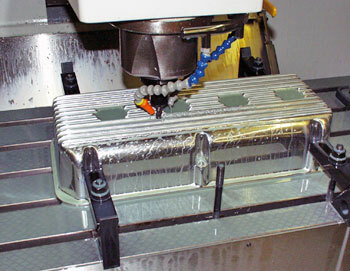 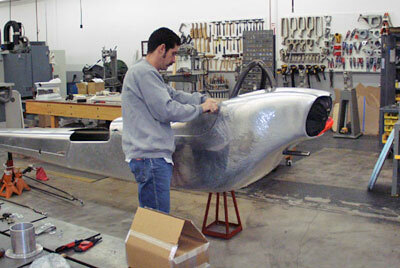 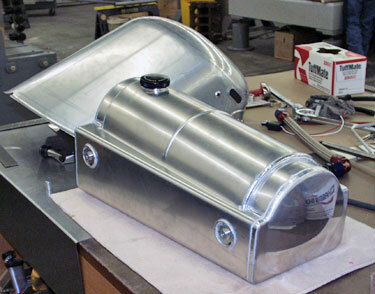 The first project was the full aluminum body. 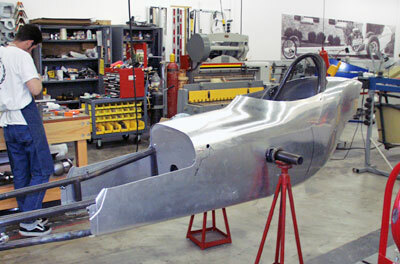 Hanna started by installing the rear body mounts to the chassis. 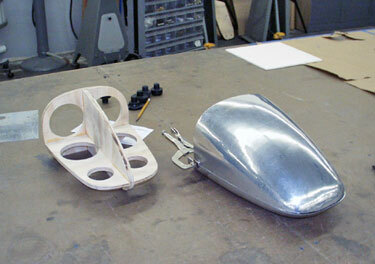 Hanna built a wooden form to let him shape the nose cone. 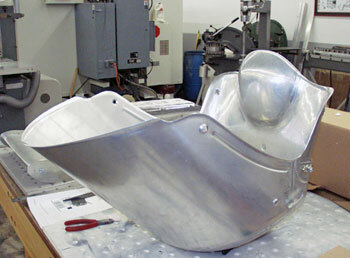 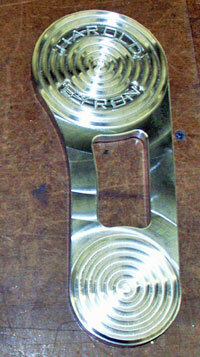 The seat proved to be tricky as it incorporates a 3rd member cover. 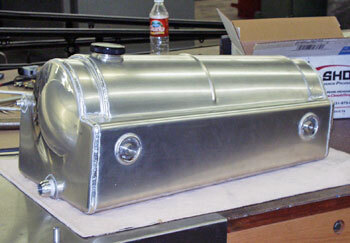 Hanna wanted to maintain the "look" of the original Moon fuel tank but increase the amount of fuel it would hold. 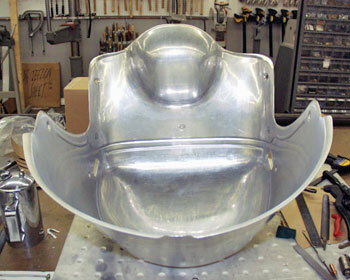 This his version of a Moon-cackle-tank. 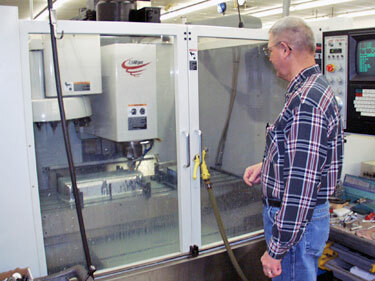 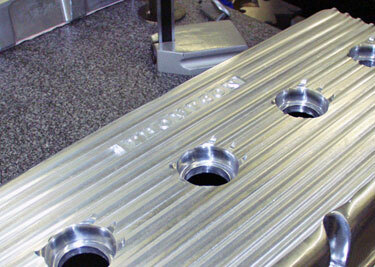 Among the "trick" parts machined at Hanna's are the clutch pedal and throttle pedal. 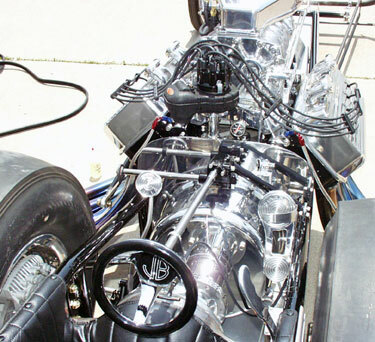 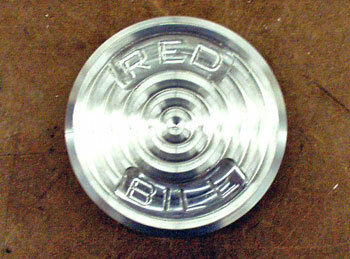 The custom steering wheel made for Jerry Baltes. 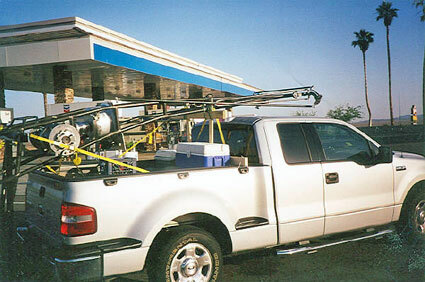 No problem is too great for team Hanna. 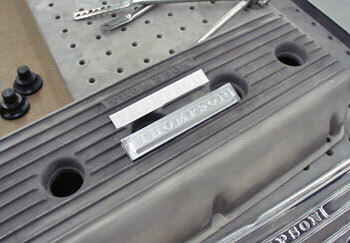 When they were unable to find a pair of nice Mickey Thompson aluminum valve covers (which Baltes ran in 1964) Hanna got a pair of aftermarket covers and machined the Thompson name in them. 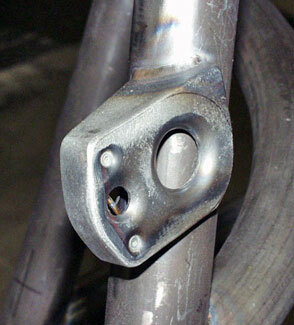 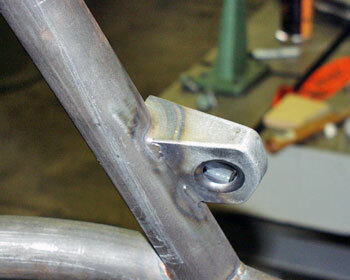 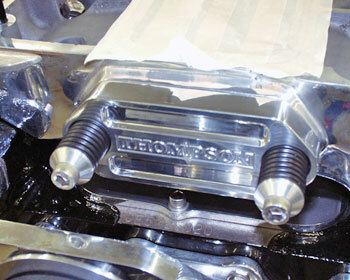 They also machined a Thompson blower manifold pop-off assembly from scratch. 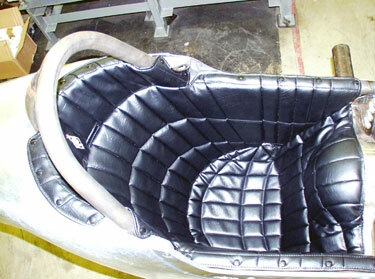 The original upholstery was recreated in house. 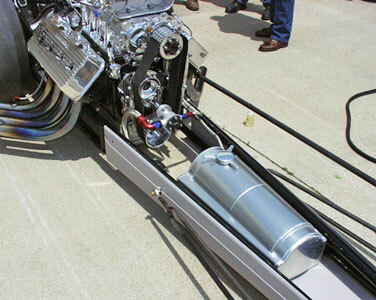 A later model Enderle injector was modified to reflect the 1964 look. 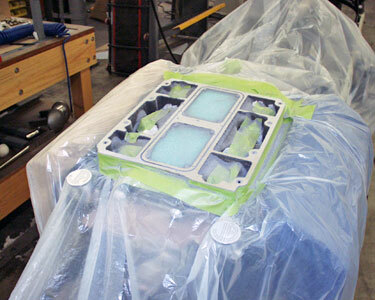 Great care was taken to insure that the blower to manifold surfaces were dead flat. 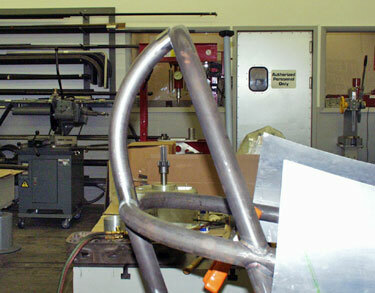 The chassis is powder coated and ready for final assembly. 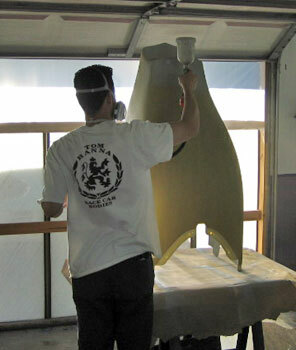 As the major part of the work neared completing Hanna's shop looked uncharacteristically messy. 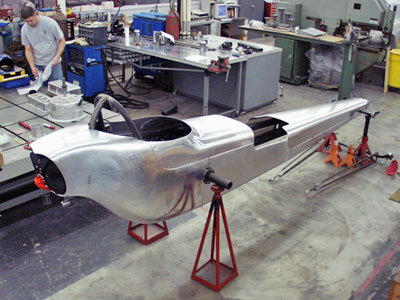 Once it was finished to Hanna's standards, the body was primered. 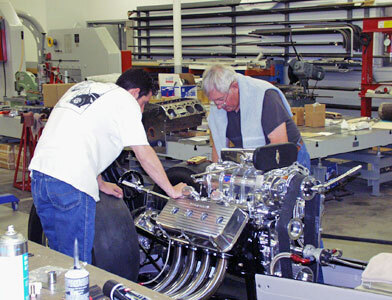 Bob Creitz assembled the engine and did the installation. 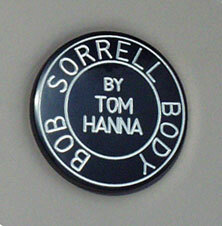 As a tribute to the late Bob Sorrell, Hanna made this special emblem in place of his standard logo. 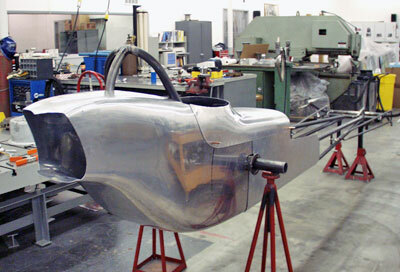 Missing only paint the finished car sees daylight for the first time outside of Hanna's shop. 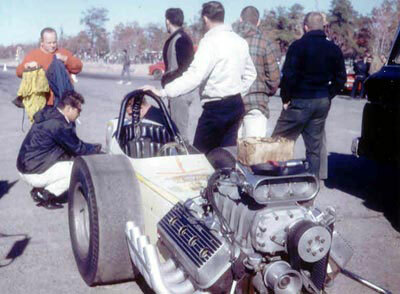 Tom Hanna, Jerry Baltes and Bob Creitz. 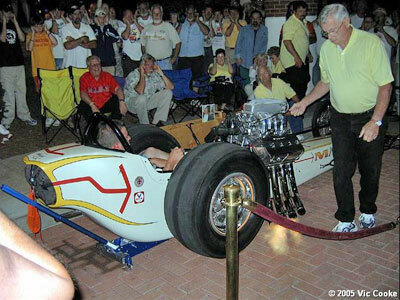 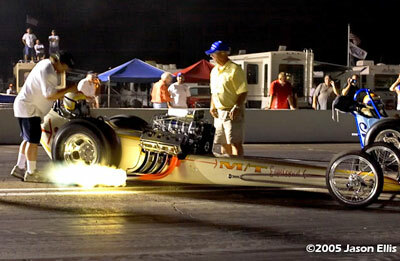 The car made its Cacklefest debut at the 2005 National Hot Rod Reunion at Bowling Green, KY with Jerry Baltes in the seat. 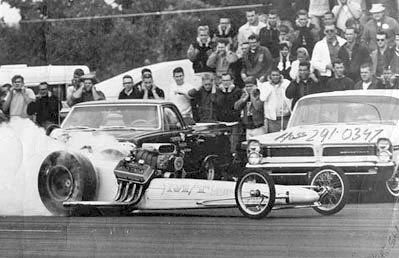 It also joined the "Queen of The Hop" club with a display and fire-up on Friday night after the CHRR Honorees Award Presentation. 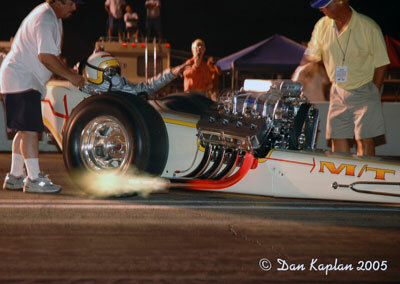 Cheesecake shots from the CHRR debut in 2002. 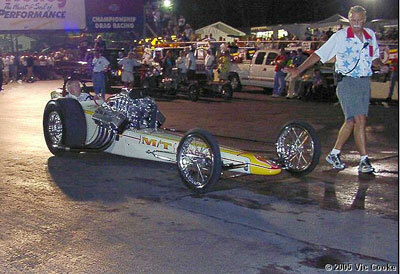 The cars next appearance was at CHRR XIV (Cacklefest VI) in 2005. 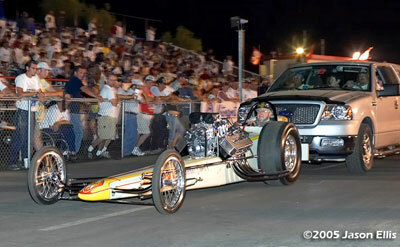 Cacklefest parade at Bakersfield in 2005.